Alumna Tammy Hayes pictured with her curriculum, the Ready to Learn Book Series"
At the end of February, Trevecca alumna Tammy Hayes was back in Canada, visiting family. 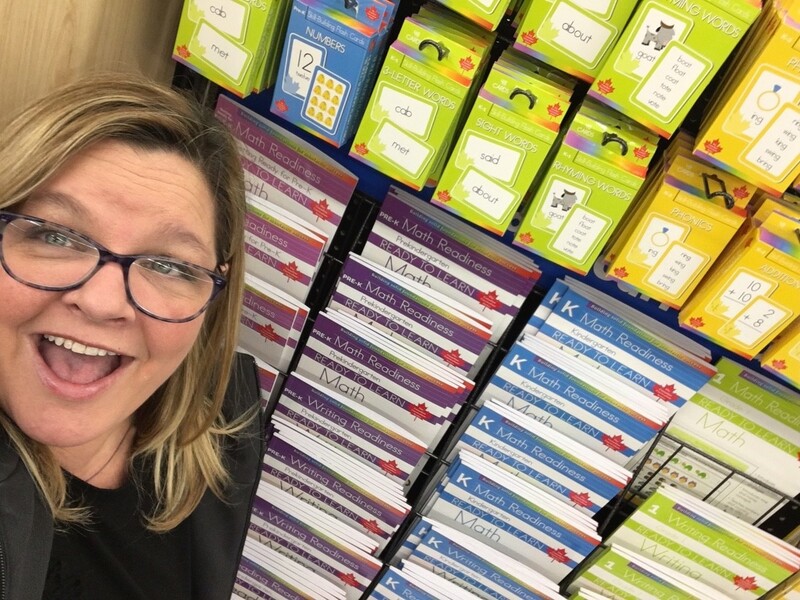 During the trip, she stopped by a local Wal-Mart, led her mother and sisters toward a display of educational workbooks and curriculum and waited. Hayes is the creator of the Ready to Learn Book Series, a curriculum series designed to help parents teach their children at home. Aligning with current Canadian pre-K to third grade standards, the series encompasses reading, writing and math for each grade level. The materials include 18 individual workbooks, six collections workbooks, lap pad books and flash cards to support learning. The self-proclaimed “product of Trevecca” earned her doctorate in leadership and professional practice from the University in 2017. The Ready to Learn Book Series is already for sale in Wal-Mart locations across Canada with nearly half a million books in the initial offering. Wal-Mart Canada has already reordered for the upcoming back-to-school season. Hayes is also in the process of adapting the curriculum for U.S. markets. Initially, Hayes was approached by Flowerpot Press to create the curriculum. The company, which has headquarters in Toronto and Franklin, Tenn., was looking to create a curriculum support series. Hayes, who grew up in Canada and has taught in both Canadian and U.S. school systems, was the perfect person to create the curriculum. “[Flowerpot Press] were friends, and they reached out to me and said that Wal-Mart was interested in putting out a curriculum support series for parents to buy to help their kids at home or homeschoolers and asked if I’d be interested in writing something like that,” she said. Hayes, who serves as a literacy coach for grades K-5 in Tennessee’s Williamson County School System, says she wants the curriculum to help parents feel confident as they work with their children. In additional to providing instruction and encouragement within the various pieces of the curriculum, Hayes also wanted to provide additional resources. A website for the curriculum is in the works and will feature answer keys as well as a blog where Hayes will include additional tips, tricks and activity suggestions. Hayes, who wrote the curriculum last summer, felt well prepared for the project. She’s taught each of the grade levels the curriculum covered and knows what it’s like for parents to teach their own kids. More than that, she wants parents to experience that special moment when a child understands something new. Hayes is already at work on another series, a summer bridging series designed to help parents curb learning loss over the summer when kids aren’t in class. She lives in Franklin, Tenn., with her husband of 32 years. They are the parents of four children and have two grandchildren. Learn more about Trevecca’s Ed.D. program.